Houghton Mifflin Harcourt, 9780547614816, 320pp. 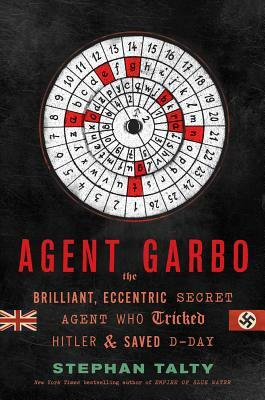 Agent Garbo tells the astonishing story of a self-made secret agent who matched wits with the best minds of the Third Reich — and won. Juan Pujol was a nobody, a Barcelona poultry farmer determined to oppose the Nazis. Using only his gift for daring falsehoods, Pujol became Germany’s most valued agent — or double agent: it took four tries before the British believed he was really on the Allies’ side. In the guise of Garbo, Pujol turned in a masterpiece of deception worthy of his big-screen namesake. He created an imaginary million-man army, invented armadas out of thin air, and brought a vast network of fictional subagents whirring to life. His unwitting German handlers believed every word, and banked on Garbo’s lies as their only source of espionage within Great Britain. For his greatest performance, Pujol had to convince the German High Command that the D-Day invasion of Normandy was a feint and the real attack was aimed at Calais. The Nazis bought it, turning the tide of battle at the crucial moment. "Juan Pujol is deserving of this biography, which captures not only his humanity, but also his humanism. Stephan Talty has delivered a beautiful report of every impossible day of Pujol's life, and AGENT GARBO is a confirmation of Donne's devotional, that 'when one man dies, one chapter is not torn out of the book, but translated into a better language.'" "Talty gives us an appreciably richer picture not only of Pujol but also of an interwar period that could produce someone willing and able to undertake the duplicity required of a double agent. Along the way, the author captures the chilling realities of bloody battlefields, tense war rooms and besieged London. Elegantly crafted." "A wonderful book for WWII buffs, a true-life spy thriller with about as much intrigue and excitement as you’d find in a le Carré novel."